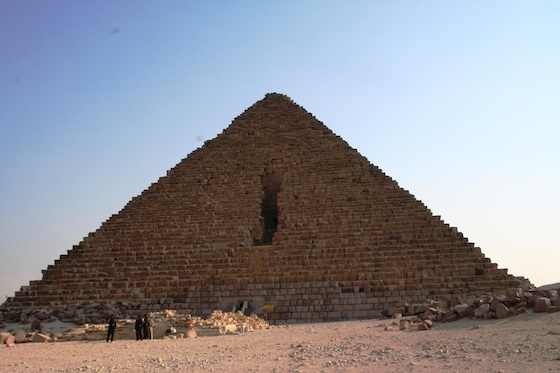 The third of the major pyramids at Giza belongs to Mekaure. This is the smallest of the three, rising to a height of 65 meters (213 feet), but the complex preserved some of the most stunning examples of sculpture to survive from all of Egyptian history. 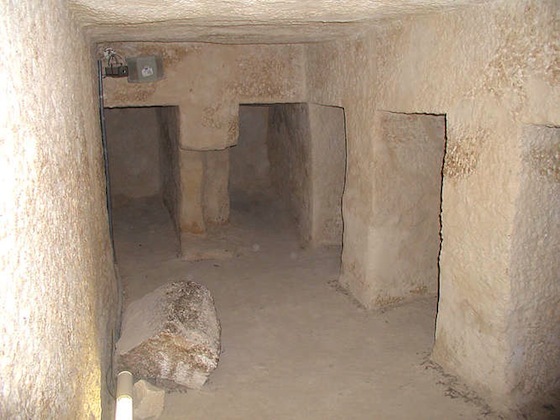 Mekaure’s pyramid chambers are more complex than those of Khafre and include a chamber carved with decorative panels and another chamber with six large niches. The burial chamber is lined with massive granite blocks. His black stone sarcophagus, also carved with niched panels, was discovered inside, but was lost at sea as it was being transported to England. ​Within Menkaure’s mortuary and valley temples, neither of which were completed before his death, excavation revealed a series of statues of the king. 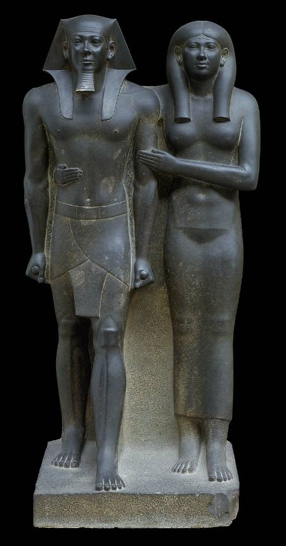 The stunning diad of the king with his primary queen, Khamerernebty II (now in the Museum of Fine Arts, Boston), as well as a number of triads showing the king being embraced by various deities, were discovered in the valley temple and were originally set up surrounding the open court. This temple was still an active place of cult late in the Old Kingdom and was almost entirely rebuilt at the end of the 6th dynasty after it was heavily damaged by a flood. Cite this page as: Dr. Amy Calvert, "Pyramid of Menkaure," in Smarthistory, August 8, 2015, accessed April 21, 2019, https://smarthistory.org/pyramid-of-menkaure/.